Synopsis: Unlike the other barnyard pigs, Peddles sees life differently. He thinks about eating pizza, soaking in a bath tub, sitting on a toilet and going into space. The other pigs tease him, but Peddles’ dreams even bigger. One night he hears a joyous sound coming from the barn and watches humans stomping and twirling. He wants to dance. When he finds a pair of red boots in a bag of shoes, he tries them on, stands up, falls over on his back and can’t get up. His friends step in and give him a nudge. Elizabeth Rose Stanton has written a playful and adorable story about Peddles, a pig with big dreams. Peddles will charm you from the first to the last page. What child would not giggle at the sight of pig poop! And look at that cover! This is a humorous story about self-discovery and friendship. Children will cheer for Peddles for his big ideas and seeing a life for its possibilities. They will ache when he falls down on his back and they will smile when his friends nudge him forward. Children will identify with Peddles and laugh at the unexpected ending. The text is spare with humorous and expressive illustrations that will melt your heart. This is a wonderful example of how Stanton’s colored-pencil and watercolor illustrations really show the story. Elizabeth Rose Stanton is the author of Henny, a rollicking story about a chicken with arms. Visit Stanton at her website. Opening: On the Island of Roses, there once lived a lad / who was looking for more than the things that he had. / He discovered his passion to safeguard the sea / and finally knew what he wanted to be. / He adopted the nickname of Blue Ocean Bob / and decided to master this challenging job. Book Jacket Synopsis: Blue Ocean Bob loves the sea and wants to dedicate his life to protecting it. He begins a new job as assistant to Mary Marine, the Island of Rose’s leading marine biologist, and with his hummingbird guardian, Xena, by his side, works hard to carry out his duties to the sea creatures both on and off the shore. When the challenges mount, Bob seeks advice from Doc the turtle, Earl the clam, and Wallace the walrus, who each help him to develop the positive attitude he needs to succeed. Brooks Olbrys has written another dynamic ocean adventure about Bob, a boy on a journey to pursue his dream of becoming a marine biologist and protecting all life in the Sea of Kerchoo. Bob is a great role model for children. 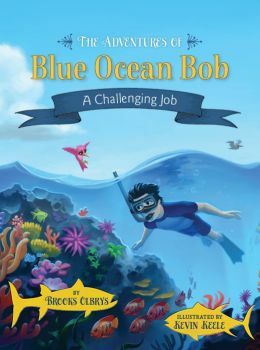 Although Blue Ocean Bob: A Challenging Job is a chapter book for emerging readers, it also can be read as a picture book to younger children. There is a special rhythm to the text and there is breathtaking artwork on every page. The plot is strong and packed with adventure as Bob overcomes many hurdles. Each chapter presents a different challenge for Bob: training a young seal to swim, hunt and survive on her own; clearing garbage floating near the pier and accidentally entangling a pelican in his net; warning the whales and dolphins that a storm is brewing; missing his marine science class and almost giving up; and freeing a stingray from a fishing line in deep waters. The characters are realistic, believable and endearing. Xena is a a great sidekick, warning Bob about dangers (metaphor for Bob’s doubt) and adding some comic relief. Bob learns valuable lessons about forgiveness, confidence, communications and gratitude. Kevin Kelle’s vibrant and rich illustrations of the ocean and sea life fill every page. They are engaging and draw the reader into the story. Make sure you check out the end pages to view a map of the Island of Roses. Resources: Parents and teachers can download a free activity guide on The Adventures of Blue Ocean Bob website. You can preview the first chapter of the book for free and view a trailer for the first book in the series. This is a unique series because Olbrys has used “timeless principles of achievement,” to encourage children to dream big — Think it. See it. Believe it. Achieve it.